1)Process the biscuit/cookie crumbs in a food processor or by hand to a coarse powder. Add the butter and rub with the finger tips until well combined with the crumbs. Press it evenly into the base of a buttered 9×9-inch baking pan. Keep it in the freezer for 10 minutes. 2)Meanwhile, peel and chop the apples to 0.5cm cubes. 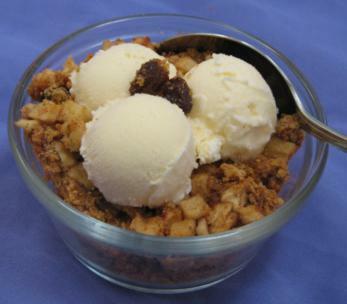 3)In a mixing bowl combine the chopped apples, brown sugar, cinnamon, raisins and lemon juice. Spread this apple-raisin mixture over the biscuit/cookie layer. Bake in a preheated oven at 350 F/180 C for 15-20 minutes or until the top is golden brown. Remove from the oven; serve warm with scoops of ice-cream of your choice.